I received this in my mailbox (no, not the electronic one, the real one) today. Manfred, a German pilgrim whom I had met and walked together for more than half of Camino Via de la Plata in 2008 had sent this to me. 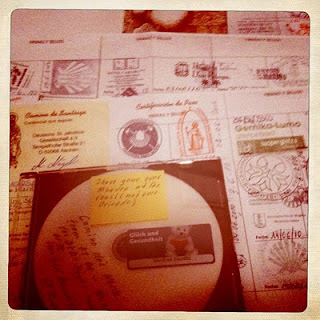 It is a copy of his pilgrim credentials and a DVD of his walk of the Camino del Norte in the summer of 2010. I have been out action on the Camino since, but the way still beckons me, especially when the Camino del Norte is the final Camino I planned to walk in Spain. Thanks Manfred, for sharing your Camino with me. While watching the video, it is as if I am also there (in spirit). No one appreciates the video more than another pilgrim. There is something about the Camino that cuts through people of all culture, language and age. The real route begins at Notre Dame cathedral in Paris, where you begin your pilgrimage walking down the Rue St. Jacques - Sant Iago in Spanish. In Medieval times, the route was so dangerous, it might take weeks for enough pilgrims to gather in the square to build a group large enough that all could travel safely together. Thanks for this information. It is really useful. We just found your blog. We wanted to let you know about a film currently in post-production called "The Camino Documentary". Our director, Lydia B. Smith, has released her latest Director’s Message via video. It can be viewed here, just click on “Director’s Message”, as well as watch the film's trailer. You can view some short clips from the documentary here. We need your help to get the word out about our film - the farther we reach to Camino lovers around the world, the more people will get behind our film and be inspired to help make it a reality. If you visit our website,http://www.caminodocumentary.org/spread_the_word.php, there are a variety of banners and blurbs that we'd love for you to post on your website/blog. Have fun picking the banner that best compliments your site's color scheme, choosing the blurb that fits best on your page or writing your own to tell your readers why you support our film! And don't forget to let us know where you post these so we can stay connected and acknowledge you on our site! I really love yr blog with all his details... can you help me with something? I would like to write an email to Benedicte the peregrina whose website is La Coquille but her site mail does not work anymore, probably too old. Seeing that picture of you with her and family, I thought u might be in touch with her. Would u mind telling me how to get a message to Benedicte -- i want to thank her for what her blog did for me. By the way my 3rd camino will be Via de la Plata in less than a month. Today is August 4, 2011. There is no comparison. Every route is different, and probably even when you decide to walk the same route again. Go again if you are able to. You know you want to. We all (pilgrims) do.